The Unexpected Guest begins on a foggy night at a lonely country house, where a woman with a gun in her hand is quietly surveying the dead body of her husband. It looks like a straightforward case of murder. Or is it? As the ghosts of an old wrong begin to emerge from the past, the case begins to look anything but straightforward, and it is up to Sergeant Cadwallader and Inspector Thomas to discover the unexpected truth... In The Pale Horse, a dying woman gasps out her bizarre story to Catholic priest Father Gorman - but no sooner has he written it down than he is violently killed. The only clue he leaves is a twisted scrap of paper on which are written nine names. 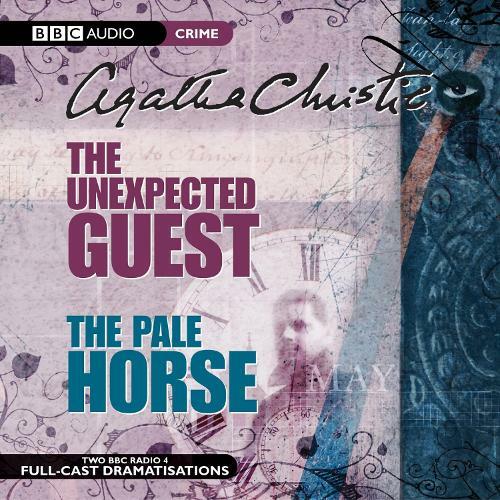 On the trail of these names Inspector Lejeune, together with academic Mark Easterbrooke and his crime writer friend Ariadne Oliver, are led inexorably to The Pale Horse Inn, in the village of Much Deeping. The three women who live there - a psychic, a medium and a witch - all seem to have some link to Father Gorman's death. And each of them has their own secrets... These two Agatha Christie stories, each with a twist in the tale, are dramatised with full casts including Sion Probert and Stephanie Cole. 2 CDs. 2 hrs.